^ "Labour 'never challenged the austerity narrative' | Owen Jones talks to Caroline Lucas". YouTube. 2015-07-31. Retrieved 2016-07-04. ^ "Open Council Data UK - compositions councillors parties wards elections". www.opencouncildata.co.uk. Retrieved 2018-12-20. ^ Stewart, Heather (2016-05-15). "Natalie Bennett to step down as Green party leader". the Guardian. Retrieved 2016-06-15. ^ a b Stewart, Heather (2016-05-31). 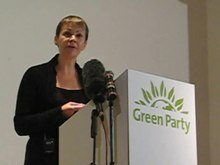 "Caroline Lucas to stand for Green party leadership as job share". the Guardian. Retrieved 2016-06-15. ^ "Caroline Lucas and Jonathan Bartley elected Green leaders". 2016-09-02. Retrieved 2016-09-30. ^ Perraudin, Frances (2015-06-17). "Caroline Lucas urges Labour to back 'progressive pacts' with other parties". the Guardian. Retrieved 2016-06-15. ^ Walker, Peter (2016-06-29). "Greens urge anti-Brexit alliance in next general election". the Guardian. Retrieved 2016-06-30. ^ "LGBTIQA+ Greens Website". LGBTIQA+ Greens. 24 Jan 2017. Retrieved 24 Jan 2017. ^ "More people join Labour since Corbyn win than are in Ukip". The Independent. 2015-09-22. Retrieved 2017-08-08.